Former UConn defensive back Darius Butler will have his number retired by Coral Springs Charter tomorrow. "He's just had a tremendous impact on this school," Charter athletic director Mike Higgins told the Sun Sentinel. "He's given back in so many ways; we felt it was the right thing to do." Butler played at UConn from 2005-08 and was a four-year starter who had 10 interceptions. He was drafted in the second round of the 2009 NFL draft by the New England Patriots. After playing 29 games and starting eight times in two seasons, he was cut by New England. Butler played the 2011 season with Carolina and has been with the Indianapolis Colts for the last two seasons. This season Butler had 18 tackles and two interceptions. 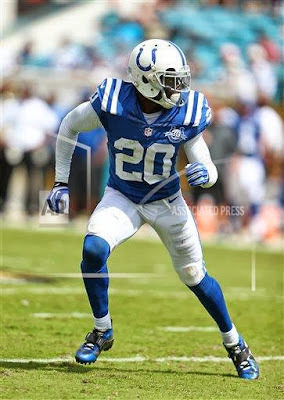 In 18 games with the Colts he has six interceptions and three defensive touchdowns. Indianapolis is off this week which will allow Butler to be in attendance when his number is retired. His brother Denzel is a senior receiver/defensive back on this year's Coral Springs Charter squad and he has 24 catches for 313 yards and three touchdowns to go with three interceptions with 7-1 Coral Springs Charter.